I guess everyone is familiar with Athens crown jewel, the Acropolis. The Parthenon standing proudly on top the Acropolis, dominating the enormous city. Greece has an amazing history, with Athens as one of its main centers. That’s why this city has so much more to offer than only the Acropolis. Inhabited for at least 3000 years, Athens is one of the oldest historical cities in the world. Because of that and the importance of the city during the classical Greek period Athens is a real paradise for history lovers. Even if you are not that interested in history, the sites of Athens makes history feel so close and real that the sites are worth walking around for a while. Interesting historical sites can be found everywhere in the city. You can visit the bigger sites with the special card. But even when you don’t want to spend any money, you can find small sites everywhere in the cities. Especially in Plaka you will find a historical site on each corner of the street, the metro stations and even through the floors of some restaurants. So let’s start with some shopping information! As the Ancient Agora of Athens includes one of the first and largest shopping centre of the antiquity. The Ancient Agora is a pretty large site that functioned as a central point for the inhabitants to meet and trade. The literal translation of ancient Agora actually is market (place), which shortly explains the purpose of the place. The ancient Agora is one of my favourite sites beside the Acropolis, as it is quite big. It feels like you walk through a messy garden with locally an historical treasure in-between the trees. The most important buildings are the Temple of Hephaestus, one of the best preserved temples from the classical Greek period and the Stoa of Attalos, that was rebuild almost completely. The last one is also a very photogenic building. I personally admire the symmetry of this building and I can spend hours trying to get that one perfect shot over here. The history of this place goes back to the Mycenaean and Iron age (1600 – 700 BC.). During this period the area was used as a cemetery. In the 6th century the Agora became a place for public events. After the Altar of twelve Gods and the old Bouleuterion where built the Agora was burned by the Persians in 480 BC. The inhabitants started rebuilding the agora and important public buildings like the new Bouleuterion, the Southern Stoa and workshops. The Temple of Hephaestus was built in 450 BC. The place grew as an important centre and during the Byzantium period the Library of Pantainos, the Basilica, the Nymphaion and the Monopteros where build. Even during the growth of the Roman agora, the area remained important and in 100 CE both agora where connected with each other. It was in 580-590 CE that Slavics destroyed the place and from 7th to the 10th CE the place was abounded. Since the Temple of Olympian Zeus is easy to watch from the outside of the site, I always admired the ruin from the outside, like many others. However, the small entrance fee is totally worth going inside. Standing that close in front of the impressive Corinthian columns made me feel small but admire the ruin even more. It made me again wonder how much effort the ancient Geeks had to put into this impressive temple. The building of the temple of Olympian Zeus started in the 6th century BC, supposed to be one of the biggest temples in Doric style. However the buildings stopped as Hippias was exiled from Athens. In 174 BC king Antiochus re-started the building of the temple of Zeus using Pentelic marble and changed the architectural style from Doric to Corinthian style. Something that’s in my personal favour as I love the frills of this style. 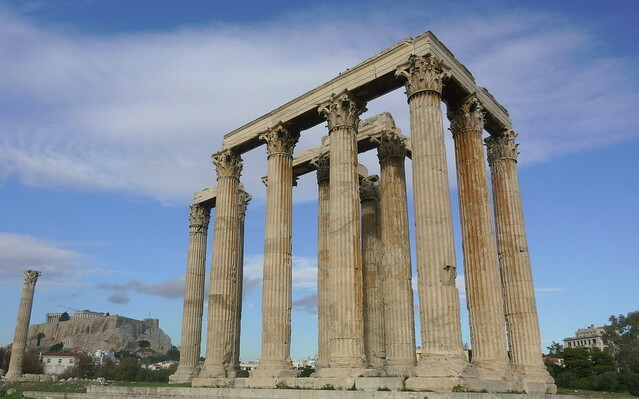 It was in the Roman period the temple of Olympian Zeus was in its final form, but not for long. During the Byzantium period Christianity dominated and worshipping the Greek gods was no longer allowed. The very unique Arch of Hadrian is placed on the other side of the Temple of Olympian Zeus. No entrance fee is needed to admire this piece of history. I’ve seen many arches during my city trips, and (I am sorry I have to say this) they are all kind of similar. But this one is different, the arch is smaller than most arches and I actually think it is a kind of a cute arch. The conditions of the Hadrian Arch are quite impressive since the monument was never protected. I love the entrance of the Roman Agora. Sunrays are shining through the columns and if you look in-between them, you can see the Acropolis on the background. The entrance is the best remained part of the Roman Agora, which is also the reason that it’s one of the most beautiful parts of the site. Thanks to the palm trees the place has a real Mediterranean feeling. Also interesting is the Tower of the Winds. When you walk through the columns at the end of the site you can find this interesting building. Although the outside is more interesting it is worth having a look inside. As the ancient agora was used as an political place, the main purpose of the Roman Agora was trade. The Roman Agora used to be an open market place. It had a large open air courtyard with colonnades on all four sides and remains of these colonnades are visible all over the site. Surely worth a visit is the Archaeological Site of Lykeion. Since it is not located in the historical centre of Athens (although it is very close), I had not seen this site before. The site is a pretty quiet and peaceful place. It is created into a garden with in the centre the remains of the Gymnasium of the Lykeion. It is very lovely to walk through these paths with beautiful flowers and plants and in-between read about the history of this place on one of the information boards. The Gymnasia was a place where young man could train their body and their mind as they believed in the ideal that body and mind should be in harmony. In the 4th century BC. The first philosophical schools where started in the gymnasia. I never knew Athens used to have a city wall until I visited the site of Kerameikos. Of course it makes sense that, like every important city, a wall was there to protect the citizens. However, interesting about this place is that the wall used to put this area in two parts. The area of Kerameikos was used as the cemetery of ancient Athens until the Roman period. The name Kerameikos actually comes from the potteries that where house here before it was used as an cemetery. The area was also the start of the Panathenaic Festival, a very important festival in honour of the goddess Athina. How to get there: The historical centre of Athens is very small, which makes it easy to walk everything. When you are at Monasteraki (metro station) you can walk to the site of Kerameikos and from there you can walk upwards to the other sites. When you use the map I have put on this page you can easily find all the sites. It is also possible to start at the Metro station Evangelismos and walk from there downwards. How much time do you need: when you are planning to go inside all the sites you will need at least one day. Keep in mind that in low season, some sites close at 15:00. Also time tables can change. I have put a link at the end of my blog where you can check the actual time tables. Visit the free sites. Although I do think the sites I mentioned above are worth its entrance fee. There are sites everywhere around the city of Athens. A view remarkable once are the Monument of lyscrates, the Roman baths, Monastiraki metro station and the monument of Filopappos. The last one is located on top of a hill and offers you a stunning view on the Acropolis, Athens and the Mediterranean. Do not visit all sites in one day. The city centre of Athens is pretty small and everything is close to each other. If you are spending two or more days in Athens I would suggest you to have more variety on each day. Combine your historical visit to the Ancient Agora with shopping in Plaka. From November to March, each first Sunday of the month a most historical sites have free entrance. Keep in mind that this also means the places are more crowded.